Bobby was Songwriter of the year '67' for "Apartment #9!" Also: his red show suit (by designer NUDIE, a well known designer for Elvis and other stars of the era) is on display in the country and western museum in Bakersfield, Calif. 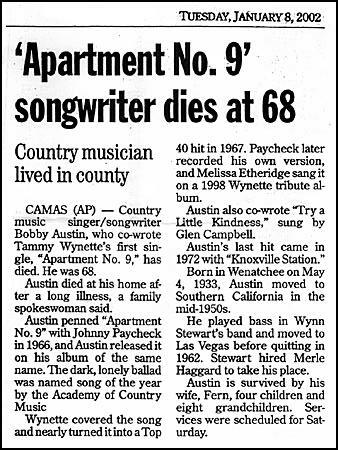 He topped the billboard charts with the album of the year, title song: "Apartment # 9 BY BOBBY AUSTIN." It charted at the top for 26 weeks BEFORE Tammy Wynette covered the song and subsiquintly had her very first #1 hit! Bob's label was Tally. In a recent article (4/28/98) in Country weekly Tammy Wynette story by Daniel P. Ray - The quote is made by Johnny PayCheck as stating "Her first hit was the Johnny Paycheck written Apt #9, released in 1966." Whenever Tammy and I worked together she would always do Apt #9." Paycheck said "she knew I'd be listening and she'd dedicated it to me. It made me feel great that my song was so instrumental in getting her record deal with Epic. 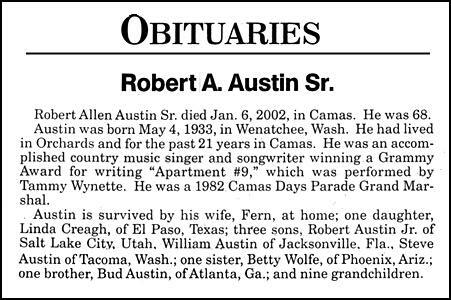 Let it be known that Bobby Austin wrote that song, using his wife's name on the label Fern Foley (I have a 45!) and Johnny Paycheck. He wrote one line and Bob shared the credit and being the guy he is. Bobby was on tour during the grammy's 67' and was unaware at the time that he was to receive a grammy for songwriter of the year, well apparently, Fuzzy Owens' secretary Espinata picked up the grammy and Bobby has yet to have ever lay his eyes on it. He still enjoyed a private pickin' session occasionally! Bobby Plays Bass, acustic and sings. He was married to Fern and they lived in Vancouver, Wa, They have 4 children and several grandchildren. Bob viewed the Rockabilly HOF site for the first time on is birthday great surprise for him. He's never been on the net. WE ALL LOVE YA BOBBY...THANKS FOR YOUR CONTRIBUTION TO THE MUSIC! Update, Oct. 2, 1998 - Bobby is very pleased with the new release of "Tammy Wynette Remembered". His song APARTMENT # 9 is featured as the 4th song on the album, performed by Melissa Ethridge. Bobby loves the new arrangement and his wife-Fern commented that it was SPOOKY hearing her husbands words in a new light. Mrs. Austin loves the entire works and has listened to the album repeatedly! Also, their is another Wynette recording of originals out by Heartland Music - any info on them? Bob's health is weakening but the new waves have him in good spirits. Also, he would like to send a special thanks to Billy Swan for the wonderful photo's he autographed and sent. Bob says he is a true brother for such a big heart...Thanks. E-mail is always welcome! Sincerely, Bobby's Buddy. Dunmore00@aol.com. Bobby's 65th birthday: Monday, May 4 (1933)! He started as a bass player in Vancouver,Wa. He moved his family to L.A. and knocked on doors until he met Buck Owens and got into a studio audition which earned him a signing with Capitol. Bobby performed with Buck Owens, Winn Stewart & the Tourists and Merle Haggard performed with him also. Bob stayed with Capitol for 7-8 yrs and then signed on with Atlantic. With Knoxville Station on the HOT TOP 20, Bobby was on the charts solo! Also a successful songwriter at the time with such hits for other artists were APT # 9 (written for Tammy Wynette - Her 1st #1 Hit) and the record company released the song penned by FERN FOLEY (Bobby's Wife). He wanted it in her name,though Johnny Paycheck wrote the line Loneliness surrounds me, without your arms around me-Bobby allowed him 1/2 of the songs rights. Additionally, Bob wrote Try A Little Kindness Performed by Glen Cambell. Bob has lived with Dialysis for several years but he also worked his other art-as a well known folk artist in the Northwest. Other record companies that Bobby worked with were Tally records and Central Song.